So, like I was saying- Elvis is coming to Collingwood this weekend- so dust off the ol-blue suede shoes and head on over the town will be hopping!! I am so excited. 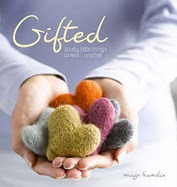 Gifted- by Mags Kandis has just arrived. I see so many lovely things to make. My danish friends will love their felted" Jule Bling" gifts for this years gift exchange. Ruby red foo baby hat- just in time for the holiday gift giving- any new babies to knit for? oh ya! Petaled slouch cap- beautiful leaf details accompanied by a lovely leaf flower brooch- complete!! I can't wait to get started. I'm already rummaging through my stash- making plans to get started. We have been very busy around here. We celebrated Canada Day in Collingwood by participating in the downtown fashion show. The main street is now open right down to the waterfront. What a lovely stroll along the water area.